Which one should we incentivize? On Sunday, December 3rd, the Community Cycling Center celebrated 22 years of the Holiday Bike Drive, a program that has provided over 10,000 bicycles to children from families living on lower incomes since 1995. The 22nd annual Holiday Bike Drive was a heartwarming delight of over 400 children finding and riding their first bicycle. Rep. Earl Blumenauer and Sen. Ron Wyden joined in to celebrate bikes, kids, volunteerism and community.. So when emerged that the Senate GOP’s tax plan would kill it, while retaining a $255 monthly commute benefit for parking cars, we knew Oregon Congressman Earl Blumenauer would have something to say about it. After all, he authored the current benefit and championed its passage in 2008. To Blumenauer, it’s a simple matter of equity. Oregon State Rep Janelle Bynum last night. Seated are Congressman Earl Blumenauer and County Commissioner Jessica Vega Pederson. Transportation is such a hot topic in east Portland right now that, “We need to be inside with the air conditioning,” said Lee Cha last night in the gym of the Immigration & Refugee Community Organization, located near the intersection of 102nd and Glisan. 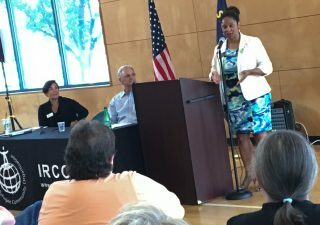 Cha, IRCO’s executive director, welcomed a panel of three lawmakers to a public forum on the topic: County Commissioner Jessica Vega Pederson, Oregon State Representative Janelle Bynum and U.S. 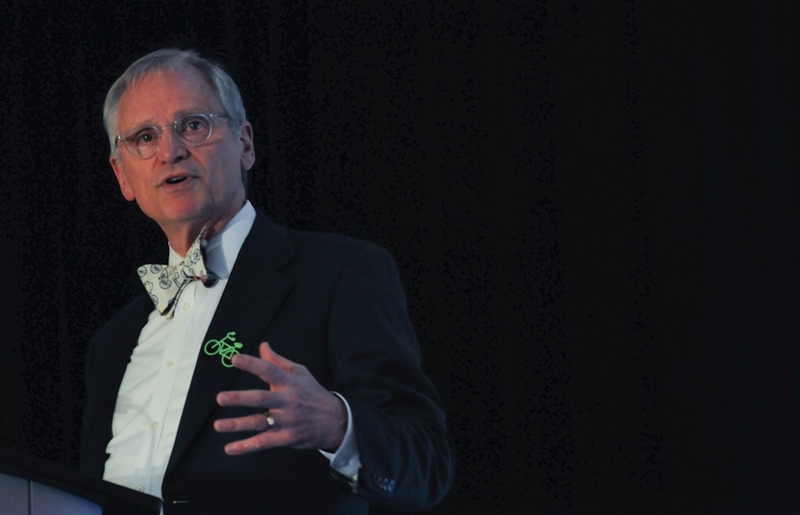 Congressman Earl Blumenauer. The trio shared their perspectives on the issues and were asked questions by the audience. Blumenauer played emcee and kicked things off. A veteran bike advocate and the face of cycling in Congress, Blumenauer knows the big picture here: He went to high school nearby and served as both a county and city commissioner before moving to D.C.
A week from today three politicians will come together to learn more about transportation issues facing east Portland. And there’s a lot to talk about. On August 3rd, U.S. Congressman Earl Blumenauer, State Representative Janelle Bynum and Multnomah County Commissioner Jessica Vega-Pederson will be joined by staff from the Oregon Department of Transportation, TriMet, the Portland Bureau of Transportation and other organizations for a Public Forum on Transportation. 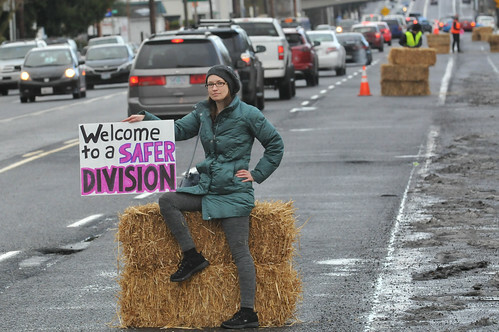 The event was spurred in part by a flurry of legislative and planning activity on two of east Portland’s most infamous and important arterials: Powell and Division. 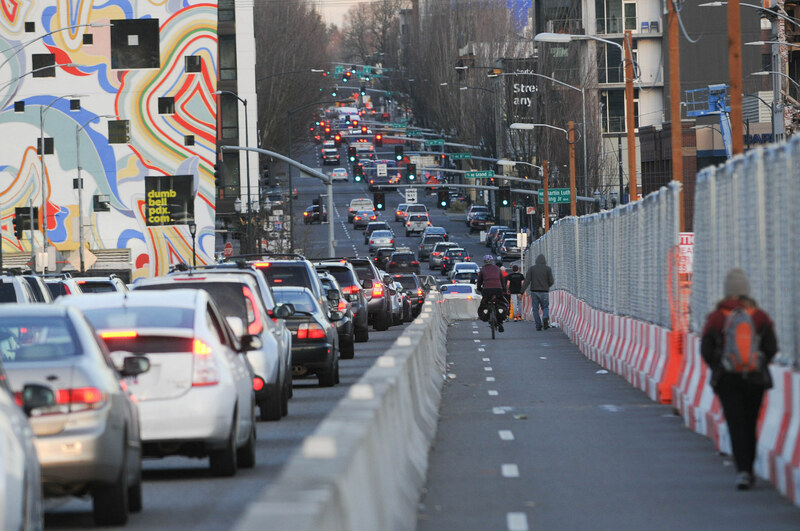 The passage of a new statewide transportation law earlier this month included $110 million in funding for outer SE Powell Boulevard and a mandate to transfer its management from the state to the city. Advocates with the East Portland Action Plan have already started organizing to make sure these funds are spent in accordance with the Outer Powell Conceptual Design Plan which calls for creation of an “urban main street” with separated bikeways throughout. The face of bicycling in Oregon isn’t that mad about our state’s new, $15 tax on new bicycles. U.S. Congressman Earl Blumenauer, who served six years in the Oregon House of Representatives and nearly 10 years as a Portland city commissioner, shared via a phone interview yesterday that he feels the tax is a “modest fee” that isn’t that big of a deal when viewed in the light of the overall infrastructure funding package. 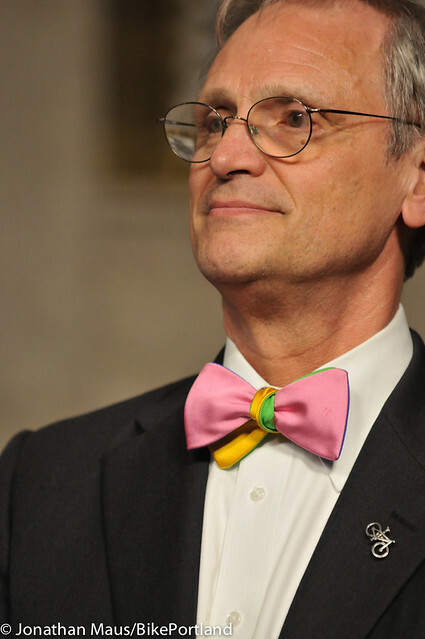 I caught up with Blumenauer from his office in Washington D.C. where he’s standing against strong political winds. “I think this is a really great opportunity for the cycling community to take a step back and think about the bigger picture,” he said. 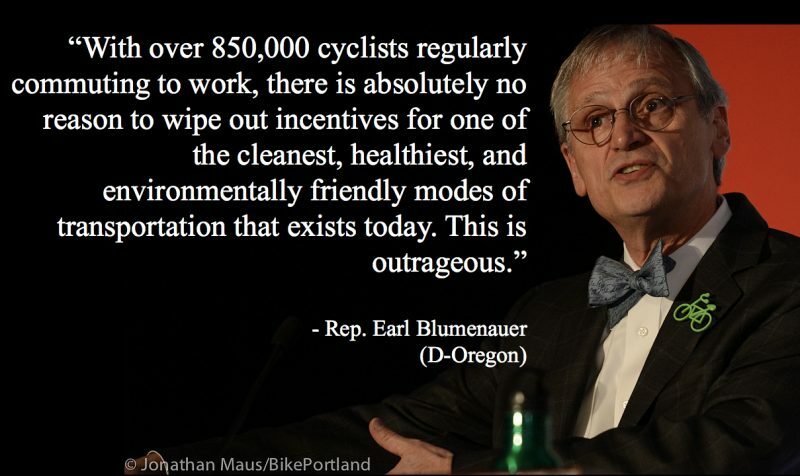 Blumenauer probably knows more about the “bigger picture” than anyone in the bike advocacy game. He has fought for bicycle-related transportation funding for about 40 years. During that time he’s heard all the anti-bike arguments you can imagine. “One of the arguments we hear repeatedly is that cyclists don’t have any skin in the game… so there’s been blowback.” Blumenauer thinks the “cyclists don’t pay” argument has only gotten louder as more money has gone to bike projects. 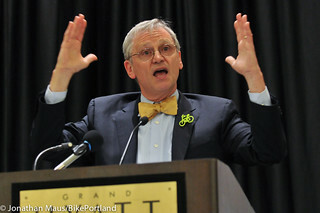 During his tenure in politics, Blumenauer has seen Oregon implement the pioneering 1971 “Bicycle Bill” which sets aside 1 percent of all the state’s highway gas tax money for biking and walking infrastructure (which should equal about $3.7 million per year over ten years in the new bill. And federal programs like Safe Routes to School, Transportation Enhancements, and TIGER grants have funded billions in bike infrastructure. “That’s big money,” he said. 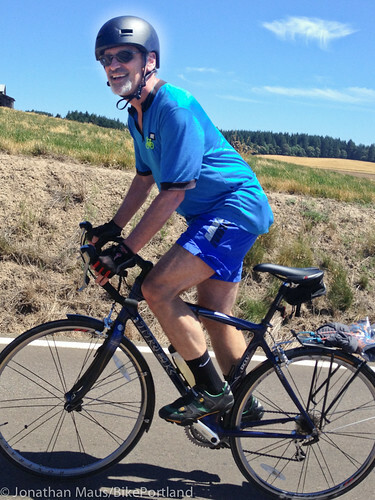 When it comes to road safety, Blumenauer (shown here riding in rural Washington County in 2013), has more skin in the game than most of his Capitol Hill colleagues. U.S. Congressman Earl Blumenauer introduced a bill today to help cities across the country to move forward with Vision Zero policies, plans and projects. The “Vision Zero Act of 2017” was co-introduced with Representative Vern Buchanan, a Republican from Florida. The bill is split into two sections: One to fund the creation of Vision Zero plans, and the other that would fund the implementation of those plans. $5 million would be set aside each year for the next five years (starting in 2018) for the planning grants and $25 million a year for the implementation grants, which could be split by up to five different entities (any political subdivision of a state is eligible, including; towns, cities, counties, and so on). But despite major losses for Democrats, Blumenauer, who won over 73 percent of the vote in Oregon’s 3rd congressional district on Tuesday, is optimistic about the future of “livable communities” — a set of issues and policies he’s built a legacy on during 20 years in office. In an interview yesterday I asked Blumenauer for his thoughts on the election, whether he’ll work with the Trump administration on a new transportation funding bill, and more. The questions and answers below have been edited for clarity. 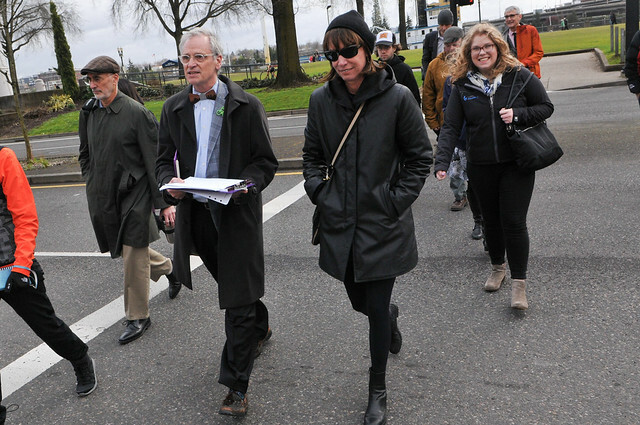 Earl Blumenauer and Janette Sadik-Khan in Portland yesterday. Former New York City transportation chief Janette Sadik-Khan has made the most of her few days in Portland this week. She’s done two official events (a talk at the Mission Theater we reported on Wednesday and an event at Powell’s Books yesterday) and two unofficial events (a media training with Portland Bureau of Transportation and Metro staff and at least one happy hour gathering).